Hand made by Aunt Ruby and her dedicated workers, these clusters consist of jumbo roasted peanuts combined with delicious rich melted milk chocolate that are hand spooned onto cooling trays. Ya gotta get ya some! These peanut clusters are so good, you can't stop eating them. Crunchy. Tasty. Yummmmmmmmmmm! I was looking for good quality chocolate peanut clusters close to home, but I wasn't having much luck. The ones I did find didn't have much flavor or they were painfully expensive (Kirwins). 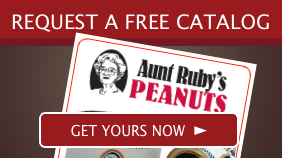 So, I took a chance and ordered two tins of Aunt Ruby's. My word, are they ever good! The chocolate appears to be about halfway between milk and dark chocolate. It's excellent. And the nuts are large and crunchy. These things can be addictive. I have to ration them or I'd go through a tin in two days. Got the 20 oz. chocolate peanut clusters for Christmas and they are the bomb. These are the best! I ship them to friends across the country. They always ask for more. Sometimes I have to drive to the store to pick them up and ship off season with an ice pack. Well worth it! 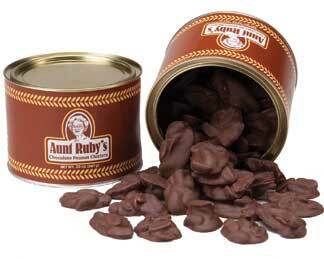 All the products Aunt Ruby's sell are DELISH! Hands down the best chocolate covered peanuts I have ever eaten! Thank you.